Nearly 26 million Americans have diabetes and the number is rising daily. Since 1980, the percentage of people under 45 with diabetes has increased by 167%. There are many risk factors for type-2 diabetes. Many of these, like family history, can’t be changed. But you can avoid or change some risk factors. One of these is smoking. We have known for some time that smoking makes diabetes complications worse. But new findings from the 2014 Surgeon General’s Report now confirm that smoking causes type-2 diabetes. How does smoking cause diabetes, or make diabetes worse? Smokers have more abdominal or “belly” fat. This kind of fat makes the body more resistant to insulin. Nicotine in cigarette smoke may make the body more resistant to cigarette smoke. This means that smokers with diabetes may need to take more insulin and have worse control of their blood sugar than non-smokers. Smokers with diabetes are more likely to have diseases that result from damaged blood vessels than are nonsmokers with diabetes. Chemicals in cigarette smoke cause injury to the cells lining the blood vessels. This interferes with the body’s ability to make blood vessels widen and to control blood clotting. For more information about the dangers of smoking for people with diabetes, check out the new information from the Surgeon General that smoking can cause diabetes: SGR50 Report, Consumer Guide, page 16. 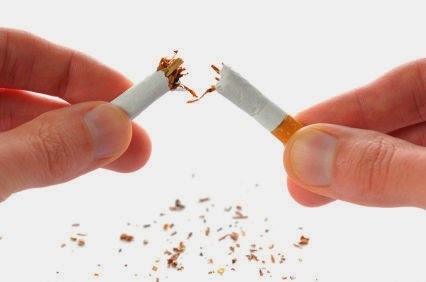 You can also let them know that free help is available for smokers who want to quit – they can call the Colorado QuitLine at 1-800-QUIT-NOW or find additional quitting resources at http://www.tobaccofreeco.org/quit.